8. 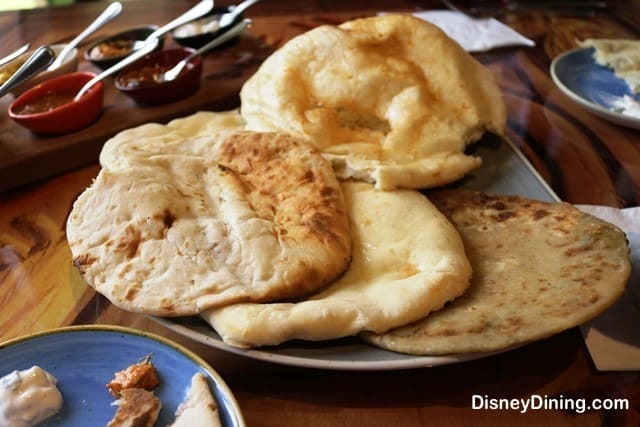 Indian-Style Bread Service – Sanaa – Disney’s Animal Kingdom Lodge brings the flavors and cuisine of Africa to life through several different dining locations both in the main area of the Disney Resort as well as in Kidani Village. Guests who travel over to Kidani Village can enjoy an amazing full service meal for lunch or dinner at Sanaa, a location which features traditional African dishes infused with Indian flavors. Guests can enjoy a beautiful dining area with glass windows overlooking the savannah outside, and there is one appetizer option that is so unique that guests simply must try it. The Indian-Style Bread Service has guests choose between Traditional Naan, Garlic-Ginger Naan, Spiced Naan, Onion Kucha, or Paneer Partha and can be ordered with nine delicious accompaniments. The accompaniments include Roasted Red Pepper Hummus, Mango Chutney, Tomato-Date Jam, Tamarind Chutney, Garlic Pickle, Red Chile Sambal, and Spicy Jalepeno-Lime Pickle.